There are many factors that you need to consider when buying a collar for your Labrador. You have to ask what type, what kind, and what size collar for lab puppy you need. Why do you need to buy a collar for a lab puppy in the first place? It gives you the option to restrain the dog for his own safety, especially when you are walking them on busy or crowded streets. A collar is used for identification purposes. There are various countries that enforce the law of having ID tags on their dog collars. The tags must contain the name and address of the pet’s owner. There are specific collars used as a form of punishment when the dog is undergoing training. There are trendy collars that you can buy to make your pet look cute and fun. If your labrador is short-haired, your best bet is a classic flat collar. The most popular of this kind includes collars made from nylon webbing and flat leather. For the dog’s safety, choose something that has a quick-release fastening feature. This will protect him from getting strangled or drowning when accidents happen. The feature detects the struggle and will automatically open to save your dog from eventual mishaps. The size of the collar that you need depends on the size of your dog’s neck. Take note that American labradors are smaller than English labradors. Female labs are also smaller than the males. The wider the collar, the heavier it is. It can cause discomfort to your dog. You have to find the balance between what is needed and what will feel comfortable for your pet. For a labrador retriever, get something with size that ranges from 1.5 to 2 inches. Length. Once the collar is fitted, there should be enough space for your 2 fingers to fit in between the dog’s neck and the collar. If it is too tight, the collar will rub the fur off the neck of your dog. If it is too loose, your dog can easily slip the collar off his head. To know the right length of the collar, measure the circumference of the dog’s neck. 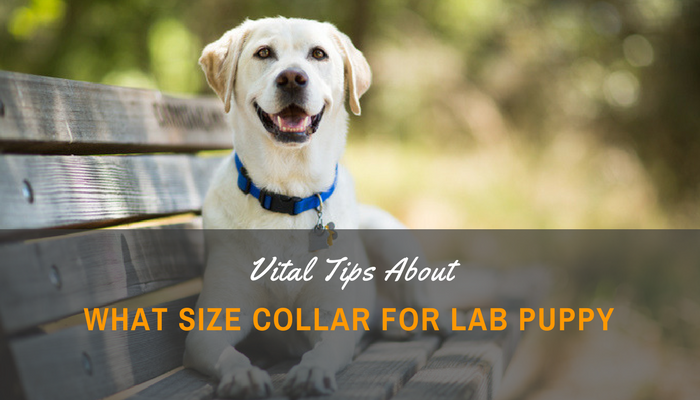 Once you get the results, add 2 inches and this gives you the ideal length of the collar for your lab. This is not so much of a hassle since you can find adjustable collars. A collar is important, but it doesn’t last forever, especially because it gets exposed to a lot of factors that make it brittle through time. Check the collar every 2 or 3 weeks. Spot any signs of damage and stretching. Replace the collar at once when you spot any defect that may irritate the dog or compromise his safety. Before buying a new collar after finding out that the old one is defective, measure the size of your dog’s neck. It may have gotten smaller or bigger, depending on the season, your dog’s weight, and the thickness of his coat. Be diligent in checking the collar of your dog since you are shopping for a lab puppy. They grow fast that result to the expansion of the dog’s neck. Check the collar once every week until they reach the age of 12 months. The collar can grow into the neck of your dog if you fail to check on it. This can be painful and uncomfortable for your pet. It is better to take off the collar of your dog when he is indoors. A damp and sweaty collar attracts bacterial growth. Take it off indoors in order to protect your dog and to ensure that the collar will not develop a foul smell. This habit will also help in extending the life of the collar, which can save you some bucks. It also avoids accidents, such as the collar getting caught on your furniture of the dog’s crate that can lead to choking hazard. Before you shop for the right collar, measure your dog’s neck, know what type suits him best and what size collar for lab puppy would fit him well.